Last week, I told you about my ClexaCon Friday adventures, where I was trying to find the bus tour and failed miserably. I also tried to pick up my press pass at the I Can’t Think Straight screening and failed miserably. On top of that, I tried to go to the badge pick-up party only for a little while but failed miserably. So, I started ClexaCon London Saturday off in a tired but excited way. Below, I explain what I did! Also, for fun footage, please check out the video below this image. Because I had so much fun at the badge pick-up party, I was a little tired when I woke up. However, at these cons, you basically live off adrenaline, so I knew I would be fine. I first tried to find the press room because I just wanted to know what kind of atmosphere I would be working in for these two days. Also, I was curious to see what other press members there were and who I knew from previous events and social media. Because vlogging is an exciting part of my trips to these cons, I decided to film everything I came across when I started exploring the convention that morning. The abundance of unicorns made me very happy and there were already autograph queues at 9:30 am! The vendor part was much smaller than the Las Vegas vendor part but the essentials were there: queer books, shirts, magazines, and accessories. I also quickly found the main panel room and the smaller panel rooms. I immediately noticed it was a very smart location for this pop-up ClexaCon event. They wanted to make it a much smaller and more intimate con than the Vegas one. Working with two floors definitely brought that vibe. The press room was on the lower ground as were the rooms for the Q&As and the photo ops. So, leaving or entering the press room, we occasionally bumped into some long lines but you did not see those on the main floor. That made the main floor a more active area but not with too many people. If you had troubles with large crowds, I think this con was less overwhelming than the Vegas edition. I had to come back from exploring quite quickly because Kat’s interview was scheduled at 10 am. Like I said, I was nervous again. I had two questions that I really wanted to ask her. Plus, I had a bunch of questions from my Instagram followers. With only 15 minutes of time and many other press members present, I could not ask the questions from my Instagram followers, unfortunately. I was really happy I got to ask my two questions though. And, I think she may have recognized me from Love Fan Fest. She really is the sweetest and she takes the time to answer your question to the best of her abilities. I appreciate her dedication! After the interview, I made sure to take some time to edit the footage and put it online immediately. You can watch it here. I was able to talk to some of the other visitors after that, which is exactly the reason why these cons are so much fun. They really do create a sense of community and talking to everyone else present is just so wonderful. You don’t feel as if you stand out. Nearly everybody is part of the queer community so these are the moments you are the majority. There was one issue they talked about that I had never even considered. If you identify as non-binary and you are in a relationship with someone, are you then straight or queer? Are you part of the queer/LGBTQ+ community or not? Whoa! Then, it was time to visit Kat’s panel. It was her first panel by herself so that was special. I think we learned quite a few things. For instance, I now know she was an Uber driver for quite some time. She described that as being very helpful being an actor studying people. I loved how she talked about the pants she wore in season 1 and how her outfits changed over the season. At times, it was fun and at times, it was heartwarming. 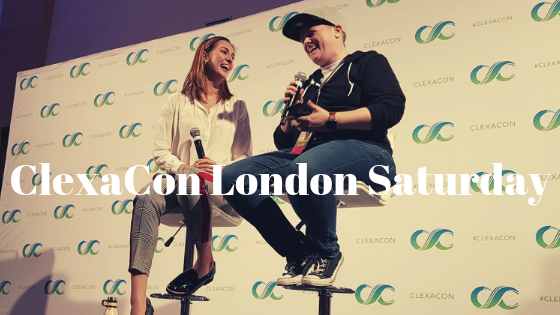 Next week, I’ll talk about the rest of my ClexaCon London Saturday adventures. In the meantime, don’t forget to subscribe to my YouTube channel! I upload a new video every Wednesday that discusses LGBT+ events or movies. 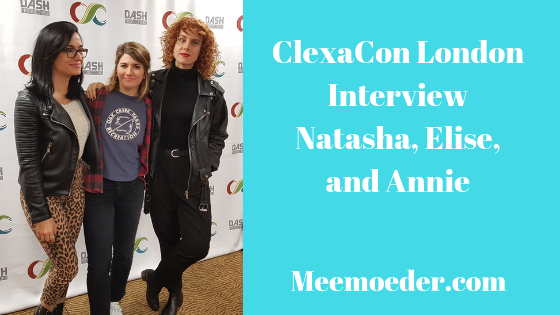 PS here are my interviews with Natasha, Elise & Annie, Jamie Clayton, the team behind I Can’t Think Straight, Nicole Pacent, Mandahla Rose, the writer and producer of Different for Girls, and the directors of ClexaCon. 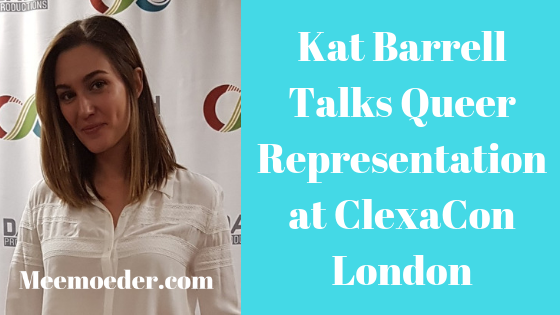 As you may know, I visited ClexaCon London in November last year. I have been publishing the interviews of the press room but I have not had the time yet to write down everything about my experience there. 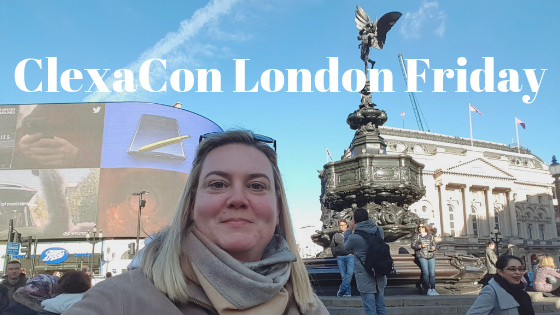 So, here are all my ClexaCon London Friday adventures! Below this image, you can also find my vlog. November 1, I flew to London for ClexaCon’s first international pop-up event. The official event was on Saturday and Sunday but since I know that ClexaCon always has fun activities for us before the event, I flew in a little early. That Thursday, I walked around London a bit and enjoyed the view from Tate Modern. The next day, I wanted to vlog at the ClexaCon London Friday activities. There was a bus tour but since I have visited London more than once, I did not buy a ticket for it. Still, I wanted to see if I knew some participants and I wanted to see how excited everybody was for the event. Well, I didn’t. I could not find the bus. I did not know the official meeting point, so I just wandered around Trafalgar Square until I saw some queer people near a bus. It turned out it was somewhere near that square. Hashtag fail. I visited the British Museum before I headed to the Prince Charles Cinema, where I Can’t Think Straight was screened. It was the movie’s tenth anniversary. I did not want to visit the actual screening though as I had recently watched the movie. I was told I could pick up my press pass there. Unfortunately, as I expected, the press passes weren’t there. I already thought it sounded kind of random. One of the organizers told me that they had thought about it but decided not to. Oh well, I was planning on going to the badge pick-up party later that night anyway. I arrived at the badge pick-up party a little late. That was great though because now, I was able to pick up the press pass immediately. I did not have to wait in line for a long time. I saw some people I already knew, some people I met at the screening, and some new people. Mandahla Rose and Nicole Pacent hung out at the party as well. I was wondering if they recognized me from ClexaCon Vegas because, you know, they meet so many people at these events. Turns out they did. Historic moment: I met Emma. Who? She co-wrote and directed the lesbian short film The Date (get your copy!). We met online a few weeks earlier and this Friday evening, we finally met in real life. Loved talking to her! Also, she now adds her magic to my videos. See what an event like ClexaCon can do for our community? PS here are my interviews with Kat Barrell, Natasha, Elise & Annie, Jamie Clayton, the team behind I Can’t Think Straight, Nicole Pacent, Mandahla Rose, the writer and producer of Different for Girls, and the directors of ClexaCon. 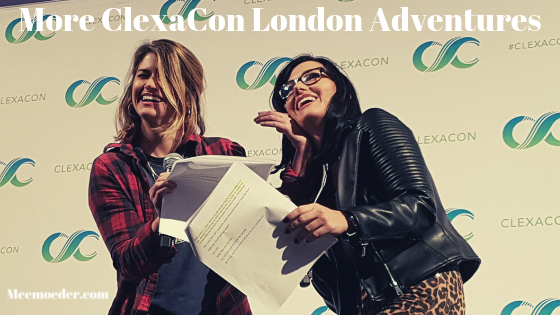 Natasha Negovanlis, Elise Bauman, and Annie Briggs visited the press room of ClexaCon London to discuss their Carmilla characters, queer representation, and stereotyping, among other things. I have uploaded the video of this interview during the con but I had not had the time yet to write down the interview. So, here it is. One question is mine, the others are from some of the other press members present. We discussed more, which you can find in the video below this image. Annie, how was your role in Carmilla challenging as you had to play both Lola and the dean? Did you prefer one role over the other? Annie Briggs: “I don’t know if I can answer which one I prefer. Honestly, I think the gift in that was that those two characters, the dean versus Lola, were so drastically different. The most challenging aspect for me was in the second season when I was playing Perry who was beginning to show signs of possession. There is a sort of grey area. There is a much subtler line between the two. Elise Bauman: “Listen to the queer community. Hire writers of the queer community. Not that I am saying that straight writers can’t write roles for queer people, I don’t think that’s the case. Do you ever come across stereotypes in your career or personal lives? Natasha Negovanlis: “All the time. It’s constant. Even when I started doing more comedy or when I did Clairevoyant, a question we got asked a lot in interviews was ‘was it weird working outside of your comfort zone?’ Annie would just cackle: ‘Do you know Natasha? Have you met her?’ Or ‘was it weird doing comedy?’ I don’t know if it is because I have dark hair or sharp features. People assumed very much I was this Carmilla type, which… There are so many elements in my personality in her, absolutely. I think we face it all the time. Especially with female characters, whether they are straight or queer, they are often two dimensional. Women are there to support the men. I think we have all been really lucky with Carmilla and to have characters that actually have agency and are doing things. Something that I’m playing with right now is that I think it’s perhaps the conflicting nature of something is what makes it interesting. Because I am petite, the fact that I box seems really weird to people. That’s what’s interesting to me. That I look a very specific way but then I have this other energy within me and that’s interesting. Annie Briggs: “Right. Like when people find out that one of my hobbies is knitting. They’re like WTF? […] I think the best I can offer is on my side of things as a content creator when I am creating roles, is incorporating layered human lives and making sure that that exists across the board. As said, Natasha Negovanlis, Elise Bauman, and Annie Briggs talked about a few more things. You can find those in the video. If you haven’t already, please subscribe to my YouTube channel and share the videos you like with your friends. That helps me more than you can imagine. PS here are my interviews with Kat Barrell, Jamie Clayton, the team behind I Can’t Think Straight, Nicole Pacent, Mandahla Rose, the writer and producer of Different for Girls, and the directors of ClexaCon. 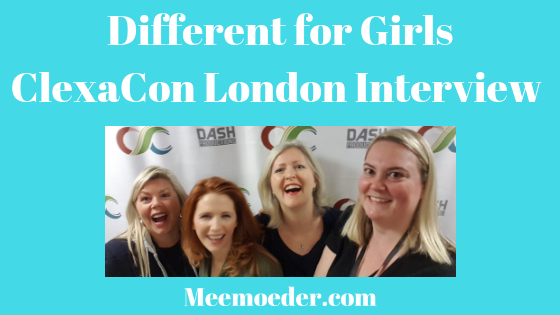 In October last year, I mentioned that I had found a new lesbian web series from the UK, called Different for Girls, and that I fell in love with it. If you haven’t watched it already, you can find it at Lesbian Box Office. At ClexaCon London, I was able to talk to Fizz Milton and Jacquie Lawrence. Fizz is the producer of Different for Girls and Jacquie is the writer and executive producer of the show. There was plenty to discuss! Below, you can find how Different for Girls went from a drama development to a book to a web series. Also, you can read how hard it was getting the web series funded. Well, I am glad it worked out, and I hope that one day, I can watch a second season! We talked about more things during the interview than what you can read here. If you watch the video, you can hear how Rachel Shelley got involved in the project. Jacquie: “I did! It was interesting because it was first on Amazon.co.uk and then on Amazon.com and one said that it was the new L Word. I thought that was wonderful. I think overall they were pretty favorable. Fizz Milton: “Well, it depends. What is new? I mean, we started the series production two years ago. We were going to film twelve episodes. It was incredibly ambitious. Fizz: “We had various pledges from people and right before Brexit, something did not work out, and we had to retrench and start again. I think it is a real message about how perseverance pays off because we were going to stop. Jacquie: “I don’t know if you have noticed the recurring white Mini. That Mini is in every scene. So really, in a way, we have not even started the marketing. It has been through word of mouth. We had quite a lot of press coverage when we first dropped because one of our main actors is very well known. The rest of the interview, we discussed how Fizz and Jacquie found their actors. If you didn’t know already, Rachel Shelley is in it. “OMG is that Rachel Shelley? !” is the number one comment that people left under my video and social media posts about Different for Girls. Naturally, I wanted to know more about how she got involved in this project. PS here are my interviews with Kat Barrell, Jamie Clayton, the team behind I Can’t Think Straight, Nicole Pacent, Mandahla Rose, and the directors of ClexaCon.